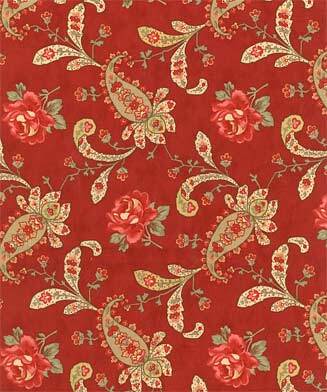 According to the 'Domestic Duties' 1846 edition, Red was the top furnishing fabric color for the season. It looked especially attractive against 'wallpaper or paint of drab, gray, dull pink, pale olive, pea or sea green'. A merchant's ledger from Iowa that same year listed both cash and barter prices for available textiles. ﻿ A yard of calico sold for 25 cents per yard or 5 pounds of butter. Fine muslin was priced at 60 cents per yard or 20 eggs. These prices were about 3 times more than 20 years earlier. ﻿The ledger also mentioned significant quantities of checks and stripes plus 'a fine selection' of furnishing goods...maybe reds?